The remote kingdom of Bhutan boasts distinctive traditional music and culture, which the government has long been committed to preserving (lest it be watered down or eliminated by, say, the incursion of contemporary pop music.) Which is what makes this partnership between opera-lovers and the kingdom particularly interesting. 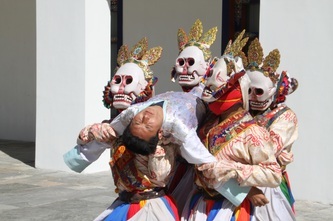 Led by a team from Rome, these classically trained Western musicians staged an opera (Handel’s Acis and Galatea) in a historic setting in Bhutan this past fall. Click on this link to see a short video by filmmaker Tao Ruspoli (who happens to a descendent of a patron of Handel’s) about their recent historic efforts.